Summer is a great time to go camping, but it can be taxing on some of your RV appliances. Here are a few tips on how you can help your RV work more efficiently, and make your camping trips more pleasurable in the summer heat. You can improve your RV air conditioners efficiency by keeping the A/C filters clean. In most cases you can wash the filters in warm soapy water, rinse thoroughly and allow them to dry before reinstalling. Another option is to clean the filters with a small hand held vacuum cleaner. Try to keep a spare set of A/C filters on hand in the event the old filters have seen better days. Ask for a shady site when you check in at the campground. This will not only help cool the RV down, but your refrigerator and roof A/C will work much more efficiently. Use your patio awning and any window awnings to assist in cooling the RV down. In addition to the awnings use your window blinds or drapes to help keep the sun out and the cooler air in. Try to avoid, or minimize using appliances that produce heat like the range burners or oven. Cook outside rather than inside whenever possible. Start the air conditioner early in the morning to get the RV cooled down before the midday heat comes on. This will help maintain a cooler temperature throughout the day. The initial cool down process can take four to six hours. You should turn the refrigerator on the day before you plan to leave, and before you put any food in it. When you do put food in the refrigerator the food should already be cold, and the food put in the freezer should already be frozen. Putting cold food in the refrigerator, rather than adding warm food, lets the refrigerator work less to cool down. One common mistake made is to over pack the refrigerator. There has to be space between the foods to allow for air to circulate throughout the compartment. In most situations you will have access to a store where you can buy food. A three to four day supply should be enough. To assist with air circulation you can purchase an inexpensive, battery operated refrigerator fan. Put the batteries in the fan and place it in the front of the refrigerator compartment blowing up (cold air drops and warm air rises). The fan will improve the efficiency by circulating the air and it will reduce the initial cool down time by 50%. The heat created by the cooling process is vented behind the refrigerator. Air enters through the outside lower refrigerator vent and helps to draft the hot air out through the roof vent. Periodically inspect the back of the refrigerator and the roof vent for any obstructions like bird nests, leaves or other debris that might prevent the heat from escaping. The outside temperature also affects the operation and efficiency of your RV refrigerator. When it’s really hot outside try parking your RV with the side the refrigerator is on in the shade. Periodically inspect and clean the refrigerator door gaskets. Check the them for a good seal. Place a dollar bill behind the seal and close the door. It should stay there and not drop. When you try to pull it out there should be some resistance felt. Do this in several different places and have any damaged seals replaced. Try to limit opening the refrigerator or freezer doors and the length of time you leave the doors open. Every time the door is opened it loses a few degrees of cooling. On a hot summer day it won’t take long to lose much its cooling capacity. Another key ingredient to keeping your RV cool is proper ventilation. Proper ventilation helps prevent excess heat from building up in your RV and gives heat in the RV a way to escape from the RV. Install Maxx Air vent covers over the roof vents to allow for ventilation. They are inexpensive, easy to install and they let the fresh air in, even when it’s raining. 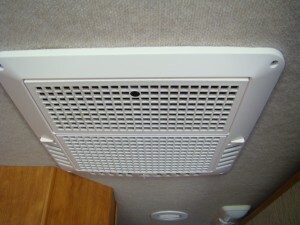 I use a vent cover on each end of our RV to promote cross ventilation. Watch the installation video. Take a couple of small portable fans with you to help circulate the air. If for some reason you can’t run the A/C you’ll be glad you have them.